Kittykat Less than 1/2 hour after taking over CURE, I get dragged away to the beach. The water being too cold to swim, I draw. Mom thought up the sword and mace. Kittykat Mom starts talking about torture chambers... see what you did Mom? 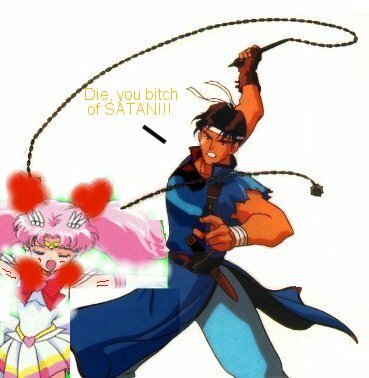 Ace Saturn has a well known darkside... but finally after to many days of being near the little pink freaky rabbit child. 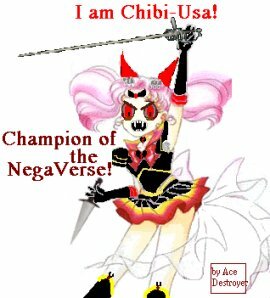 Saturn finally looses control of herself and chains Chibi-Usa in a dark pit, testing her theory that the her glaive could slice Chibi-Usa into two equal pieces with one swift motion. 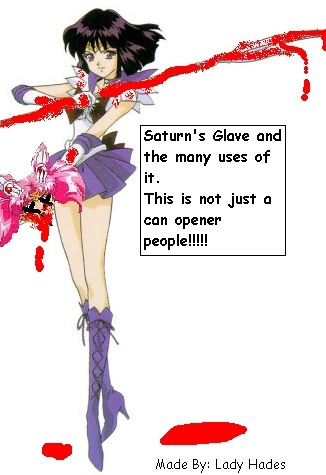 Lady Hades Hey you thought the sword pic was bad check this out, it proves that Saturn hates her guts..
Mr. Jonathan Her forehead was in perfect view. It was MADE for a bullet! 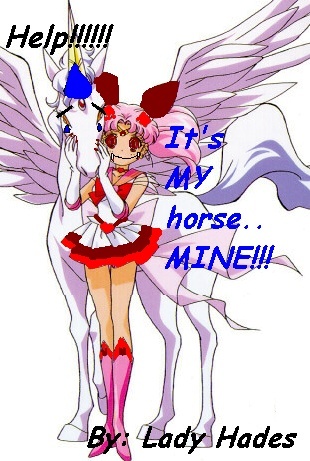 Lady Hades AAAHHHHHHH she taken that poor horse, I feel sorry for him. Mr. Jonathan Never hold people you would love to kill for ransom. 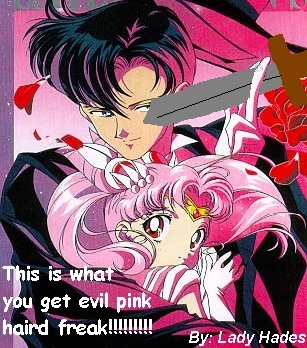 Mr. Jonathan At first, I wanted her to be strangling Chibi-Usa or jamming aknife into her, but I realized this was impossible. 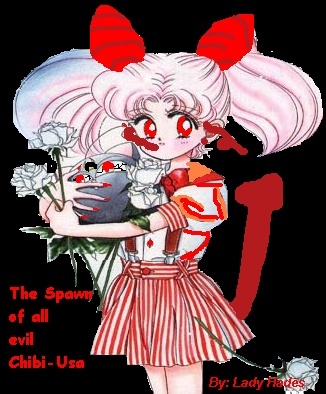 However, Hotaru was in the perfect position and had the perfect expression to be killing Chibi- Usa in some way or another, thus the voodoo doll. 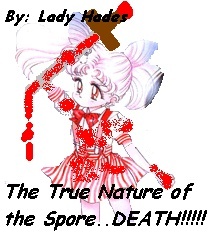 Lady Hades This is what the spore is all abput summoning evil! Sailor Nightshade I just have to say, that I made this picture while baby-sitting these two boys. They totally loved it. The next day I did another picture but didn't want to do anything to it, and they were mad at me. 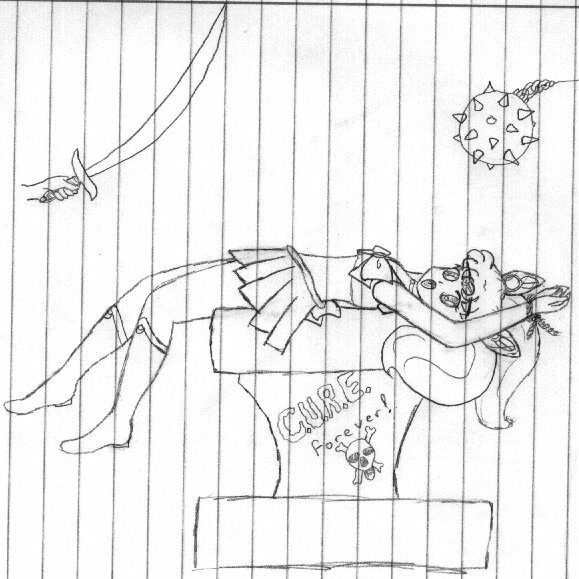 The eldest boy insisted I had to do another picture and we had a big conversation about torture and I made him a picture of her with her head in a guillotine. It's kind of sad in a obsessive sort of way. 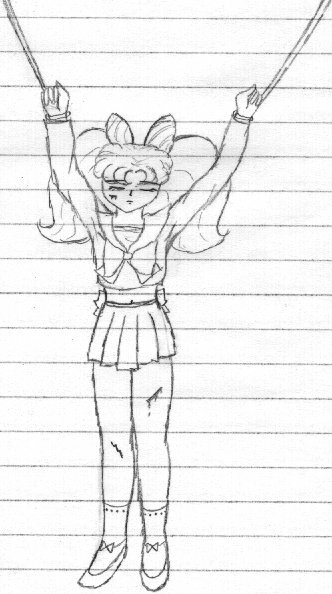 About the picture, she looks a little older in it, and her uniform colors are weird. Originaly, I wasn't going to use her uniform (which explains why the style is different) but, hey, I never said it was all that good. Mr. Jonathan Somebody told me that I was lazy using computer pictuers. 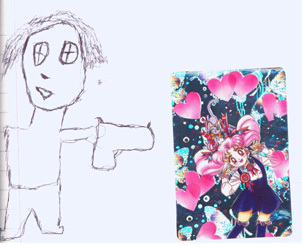 They said I probably couldn't draw. They said I was sick. Well, two out of three ain't bad, but I can draw. (I just can't scan that well.) 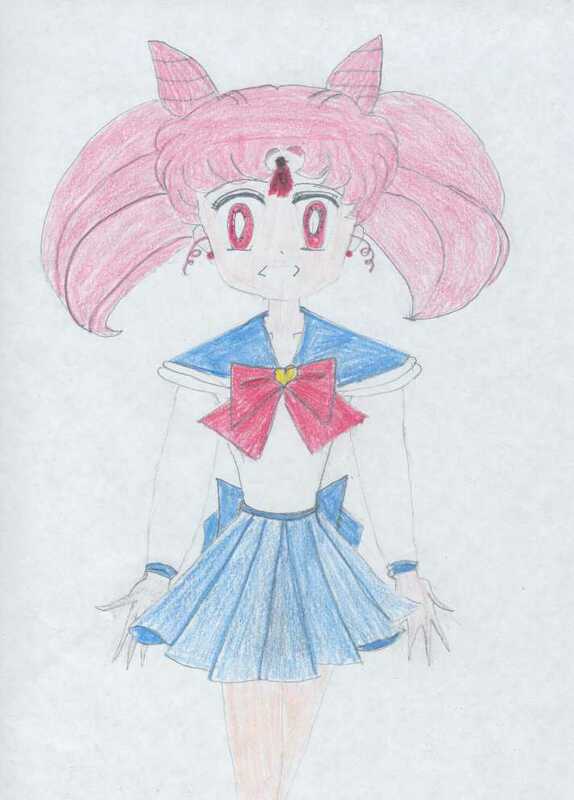 Anywhoo, here's a sample of my real drawing. I don't know how I got the idea, but it just came to me. 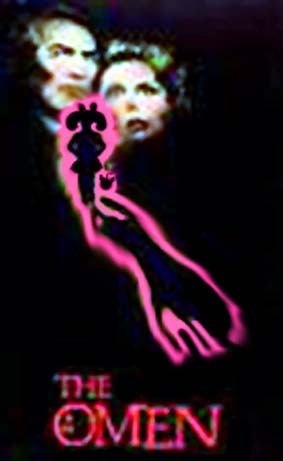 In the original, there's a guy with a cattle prod walking towards her, and it's a cover for a story my friend and I wrote, but for this, I just zoome in on Reenie and added text. 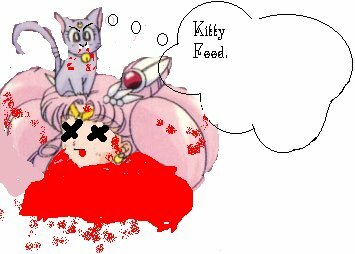 Kittykat What does Chibi-Usa fantasize about? *shudder* This is a picture that would only be found in the Spore's dreams. If I never see this picture again, it will be too soon. Rapt0rClaw I was really bored...I was looking at a picture of Urthstripe and I noticed his spear was in the perfect position...BWAHAHAHA! Spoo A friend and I were, well, "inspired" by the other artwork here and thought that you would enjoy this. Yarrow i was bored, and kinda down, then i drew this and was much, much happier. 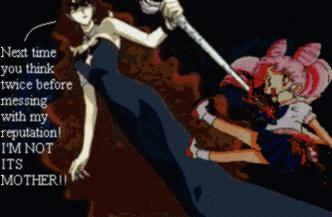 Ace I was giving thought to the night Tuxedo Mask impregnated Queen Beryl. 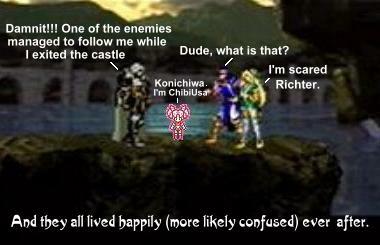 And wondered if their kid really would be Chibi -Usa in another form. And the answer I found was - YES!! 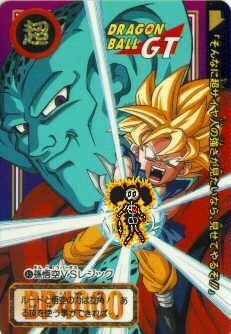 This is an old family photo of the little Spore I found in Queen Beryl's scrape book. 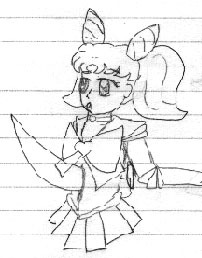 I think that is the shiny new dagger Empress Metella gave her that she is holding. Kittykat A half-finished sketch in one of my notebooks. Kittykat I can't get online, I've already updated every single webpage I own, what else can I do? Draw. So... I drew myself with my Christmas present (A Chinese sword) chasing Chibi-Usa (Muhahaha...) who is in turn chasing Cape Boy. 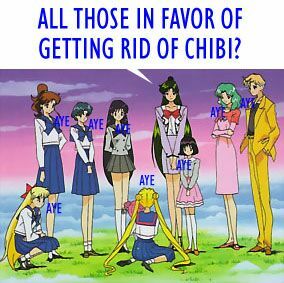 Slayer Moon A lot more than two thirds of the Senshis have made a wise decision. 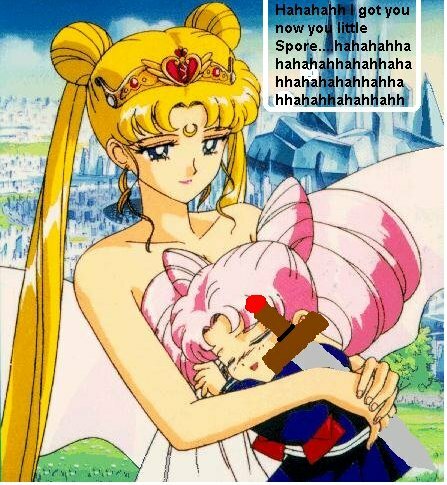 Slayer Moon Rei convinces Chibi to taste a little something new. Rapt0rClaw Once again I was bored...and after seeing how my last fanfic's red turned out gray I decided to try for a scaryer and better fanfic. 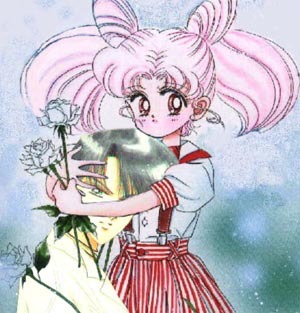 Karman Choose the link for some of Karman's CURE and MIME fanart. Spoo I was bored and figured, what the heck, I'll illustrate the contempt everyone has for "it," even those on her evil side. 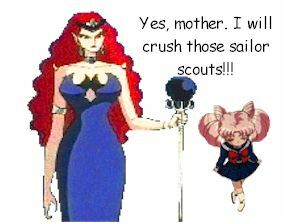 Spoo Here's what I'd do if I was Darien, and I had my daughter from the future trying to get me to enter into an incestual relationship. Po tsukino hi,hi! iam po and i realy love all the fanart stuff so i made one too :).i hope you like it.all i can realy say about it is i wacth too many scary movies. well i got to go.death to the spore! 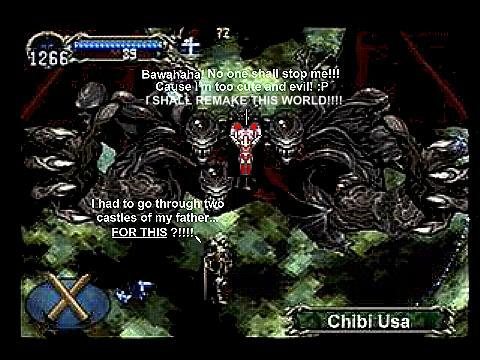 M&M Girl Chibi's true master! comments: the truth revealed! M&M Girl How else can Chibi he killed, HA! HA! M&M Girl I couldn't resist! 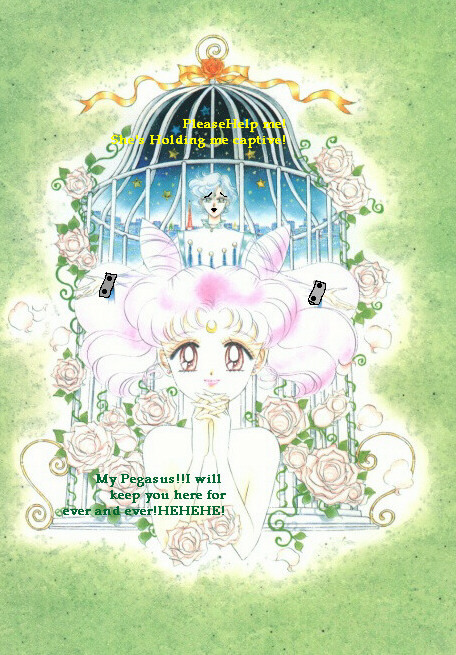 Po Tsukino & Mizuno-chan Four senshi. A volleyball net. A volleyball with two pink odangoes. You do the math. Scarlet Ruby YAY!! They FINNALY decided to kill her! Scarlet Ruby Even Luna hates the little spore. Scarlet Ruby They have all gotten together, in their best dress, to kill Chibi USa. 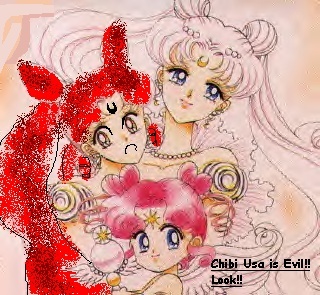 Scarlet Ruby The inners and Mamoru are all dissing Chibi USa. Scarlet Ruby The litle spore is out of the picture. Scarlet Ruby I personnaly think it looks better. 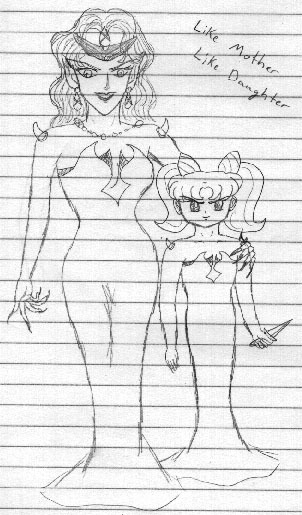 Doom Queen Beryl deserved that revenge... For what the thing have done to her reputation..
Spoo My Usagi is kind of messed up, but that's not the point. The point is, the little "thing" got its head cut off and suffered. 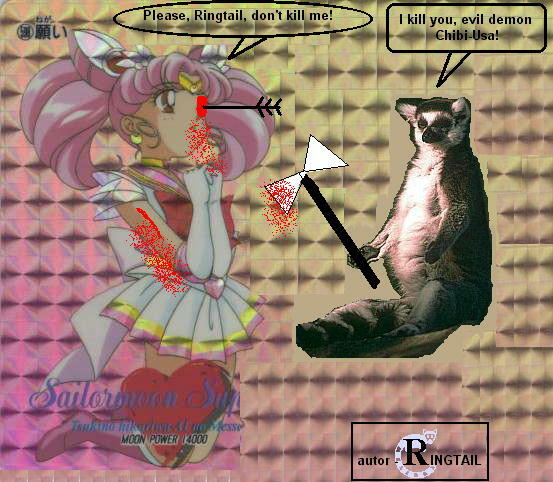 I like to think of this as one of those things Usagi dreams about but never quite has the guts to do. Spoo Lets face it- someone was going to draw it- I figured it might as well be me. 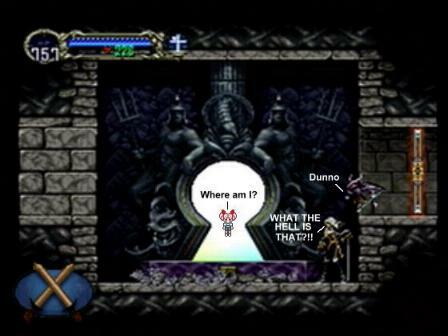 Like you've never thought about it! Spoo In my opinion, His Majesty should have done this a long time ago, like before she could come back in time and try to seduce him! 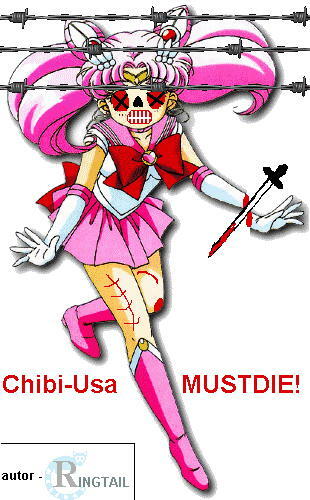 YingGirl Whoever made the Chibi Voodoo Doll inspired me to make this cool transparent gif. YingGirl Where She Came From, cause she didn't come from the sky!! 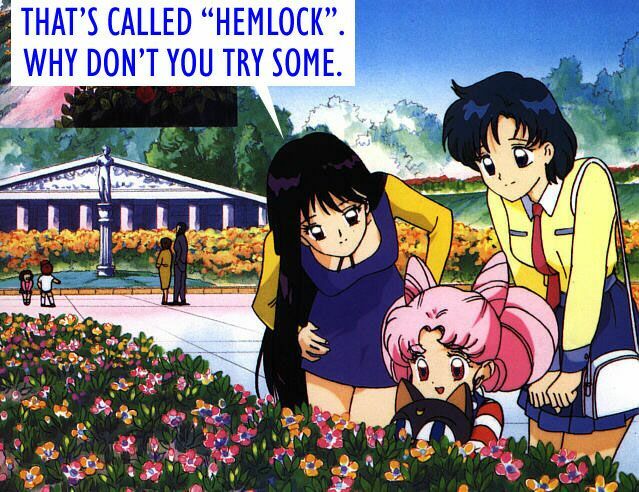 Haruka-sama Damn straight you should be afraid. Look what the little pink spore did to my Seiya plushie!!!! BURN CHIBI-USA! BURN HER I SAY!!!!!!! 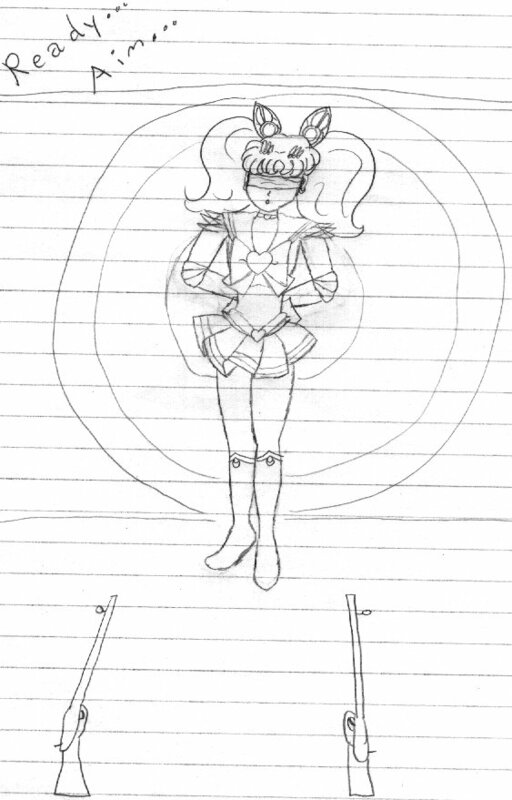 Sailormoonkitty this picture came from the idea that Super Sailor Moon could be a Super Saiyan(Thus becoming Super Saiyan Super Sailor Moon). 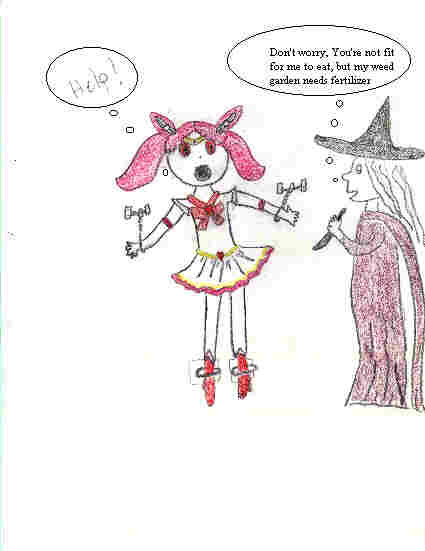 In all the pictures we drew, Sailor Moon was a Super Saiyan but never Sailor Chibi-Moon(the wimp). 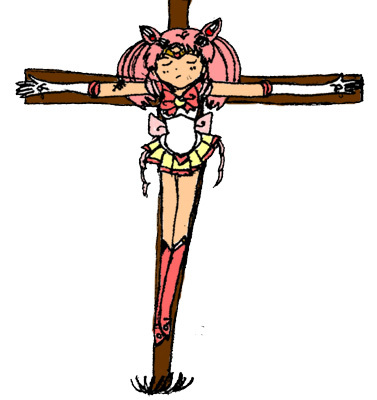 So the idea that she would be blasted away inspired this picture.